Certain musicians are dependable. Their very names on an album cover suggest an immediate indication of what's in store for the listener with near certainty. Sometimes, though, dependability can be detrimental. Occasionally a musician can fall into a rut of repetition, treading the same trails until once fertile soil becomes trampled and stale. 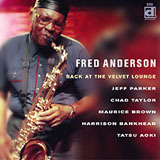 Fred Anderson, one of the Windy City's most venerable and consistent jazz fixtures, isn't in this fix yet, but I fear he might be heading in that direction with his second Delmark release. Once again the scene is the Velvet Lounge, Anderson's creative music enclave for going on two decades. Once again the usual associates are in attendance on the bandstand. 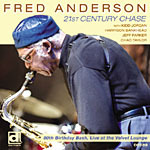 Stalwart bass anchors Tatsu Aoki and Harrison Bankhead, along with drummer Chad Taylor, have each been featured prominently at various points in Anderson's dozen-strong discography. The new face is youthful trumpeter Maurice Brown, who makes an impressive recording debut, particularly on his switch from sedate to declamatory during the disc's first cut "Fogeux. 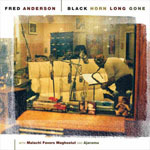 Five "new" compositions in all are unveiled, but to be honest the fresh clutch of tunes is heavily steeped in the familiar blues-based figures that form the flexible basis most of Anderson's music. It's here where the problem lies. Hearing Anderson (and his friends) blow can be a cathartic and intensely enjoyable experience, especially in person in the funky confines of the Lounge. But his palette is limited by choice and has thus far only rarely allowed for substantial deviations from standard vernacular. Bankhead does his part to vary the proceedings from what's come before by strapping on an acoustic guitar for "Job Market Blues. His scratchy ramshackle strumming sharpens a funky edge onto the tune, but Anderson still seems staunchly rooted in his stock phraseology. Jeff Parker also attempts to pull the leader out of his comfort zone on, but the stylistic tug of war ends up becoming a bit tiresome over the long haul. The overall feel is more of a typical blowing conclave at the Velvet, rather than a cut-above performance worthy of commercial circulation. Another peccadillo is the slightly muddy fidelity, unusual for Velvet sound engineer mainstay Clarence Bright. 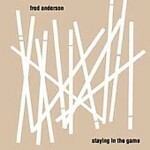 Fred Anderson is hands-down one of my favorite living saxophonists. My admiration and affection for the man and his music make the scribing of a lukewarm review all that much more uncomfortable. Longtime fans will want to check this one out, especially for his initial unaccompanied solo work on "Olivia. But listeners just becoming acquainted with his emotionally rich oeuvre should probably look elsewhere. Track Listing: Fogeux; Olivia; Job Market Blues; Syene; King Fish. 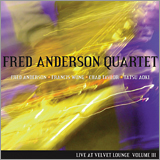 Personnel: Fred Anderson: tenor saxophone; Maurice Brown: trumpet; Jeff Parker: guitar; Harrison Bankhead: bass, acoustic guitar; Tatsu Aoki: bass; Chad Taylor: drums.